Oh you didn’t know about canine blood donors? Retired racing greyhounds make great blood donors. Read on, and then speak to your local veterinarian to see where you can sign up! Like humans, the need is always there for donations. Dogs can donate blood just like humans can and there is a constant need for donors. 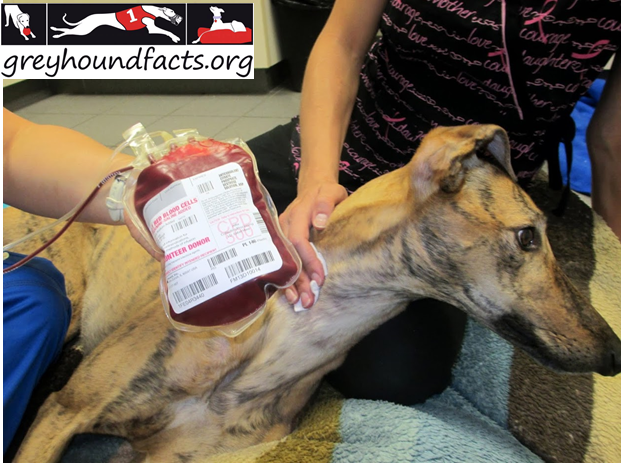 For some sick or hurt dogs, a blood transfusion is their only chance at survival. 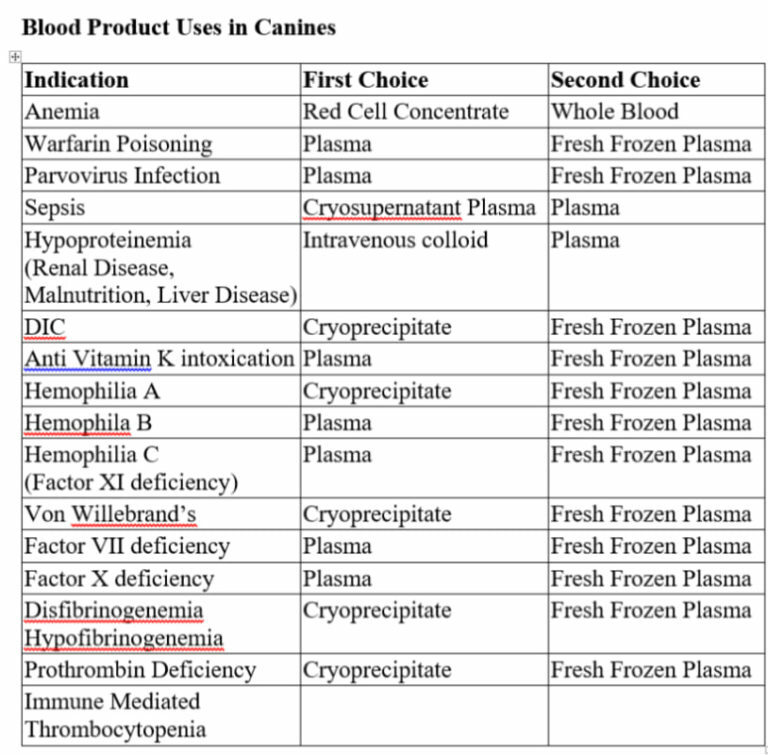 The wide range of transfusion needs might include: combating illness or disease, treating an acute blood volume loss and preventative measures in routine surgeries for dogs with bleeding disorders. Greyhounds make excellent blood donors due to the frequency of negative DEA 1.1 blood type which can be donated to almost every single canine blood type. As well, our temperament and disposition from our training at the track make us very comfortable with being handled, and our lean muscular build and prominent veins make the blood collection even easier. There are 7 major blood groups in the dog, labeled as DEA (Dog Erythrocyte Antigen) 1, 3, 4, 5, 6, 7 & 8. The DEA 1 system consists of types 1.1 and 1.2. DEA 1.1 is the most significant type and all of our donor dogs are tested to determine if they are positive or negative for DEA 1.1. Similar to people, a negative DEA 1.1 dog should only get negative blood, while a dog that is positive can get either. The donation appointment is generally 30 minutes. There is no rushing here! The actual donation, though, takes 2-4 minutes generally. Many clinics use the same technology as human donations with a vacuum system. Many greyhounds usually don’t need any sedation. The point of draw is shaved (usually the neck, but can be the leg), a light anesthetic cream is applied, and the needle inserted. The dogs are generally put into a ‘hold’ (or a hug!) which can look mean, but it is for the safety of everyone. After all, there’s a needle involved! After the donation is done, the dogs are generally given treats and subcutaneous fluids to help the recovery. The body begins to replicate blood cells almost immediately. 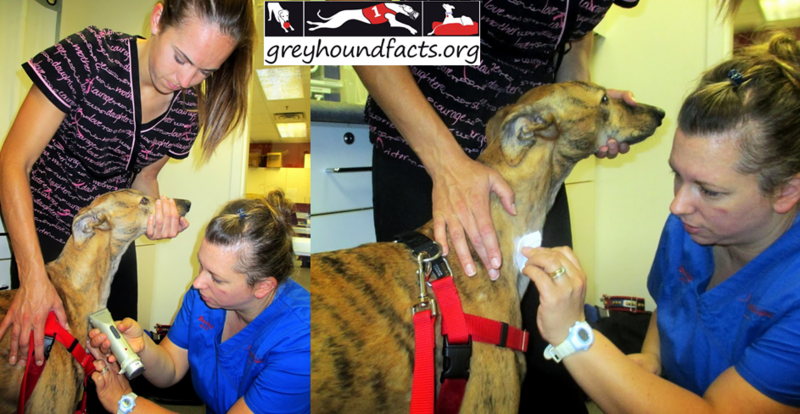 As well, by nature of their heads relatively at the same height as their heart, a dog’s blood pressure returns to normal very quickly..
“Just a little off the top!” The donation site (neck or leg) is shaved and a light anesthetic cream is applied. During the donation, the dog is generally put in a ‘hold’ (or a hug!) which can look mean, but it is for the safety of everyone. After the donation is done, the dogs are generally given subcutaneous fluids and treats to help their recovery. The body begins to replicate blood cells almost immediately. As well, by nature of their heads relatively at the same height as their heart, a dog’s blood pressure returns to normal very quickly. Each unit of blood can help save the lives of two dogs. After a donation, the blood is separated into two components – red blood cells and plasma. The different components are given to patients suffering from anemia, major injury or disease. Fresh frozen plasma is used to treat a variety of illnesses in dogs, including poisoning, snake and spider bites, heat stroke, and bleeding disorders. It is even given to newborn puppies that are not strong enough to nurse. Dogs injured in accidents are also common recipients. One donation can equate to about 450-500 mls of blood, as well as a number of plasma vials. Generally speaking, one donation can save two dogs. The need is great, and much like with the human population, the supply is often short. Please contact your local veterinary or emergency clinic to find where and how your greyhound can become a blood donor – and help save the lives of other dogs. In 2017, the National Greyhound Association issued a policy that outlined the organization’s parameters and guidance with regard to the use of NGA registered greyhounds for the purpose of blood donation. Mascot Lee Lee is too interested in the treats to come than appreciate his good deed!